Accessorizing in the fall is my FAVORITE! 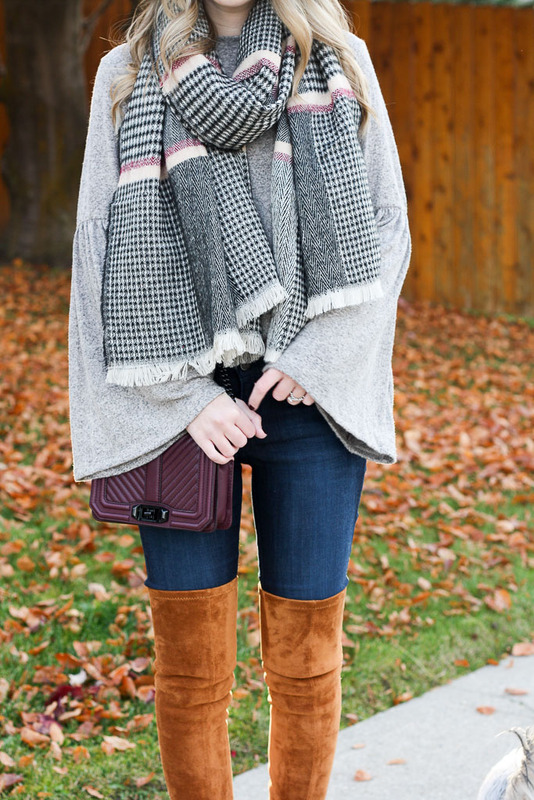 I am a girl who prefers the sunshine and warmth of summer, but there are so many great fall accessories that make layering for changing weather more bearable! 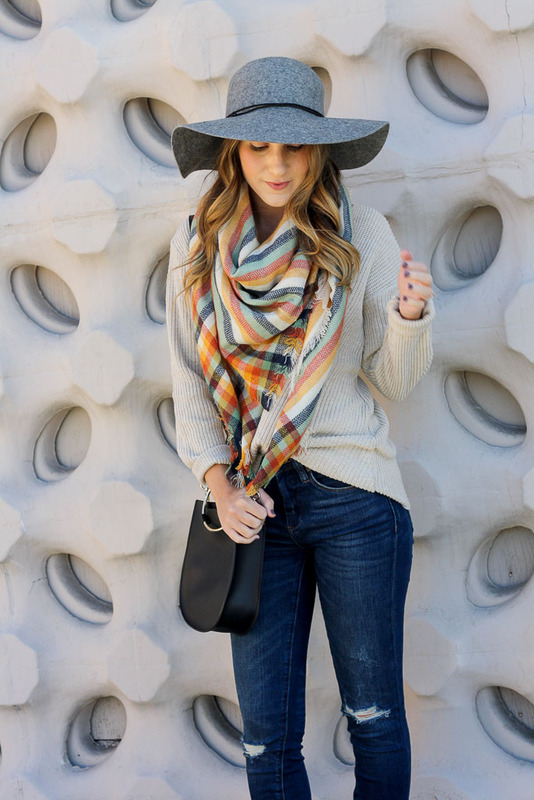 From hat options to scarves, I love fall accessories! 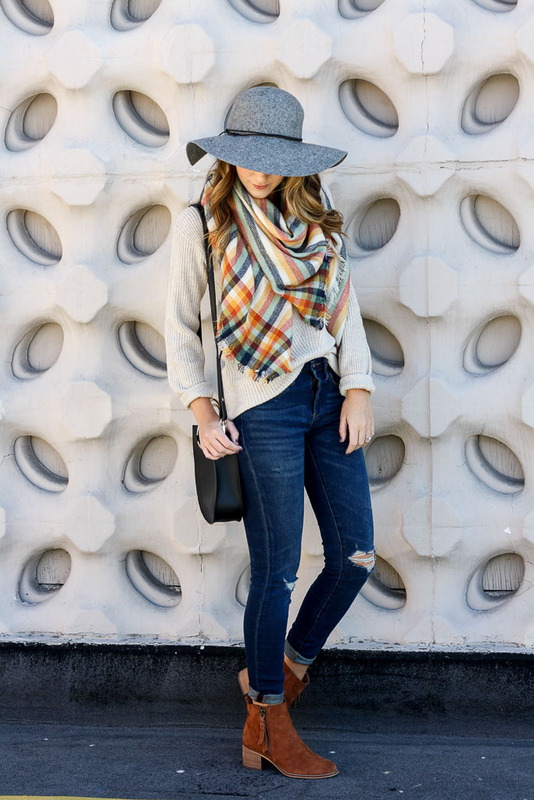 Two fall accessories that I have been wearing non-stop include wool floppy hats and plaid scarves. I love that these accessories can not only take your fall outfit to the next level, but they also add an extra layer of warmth! 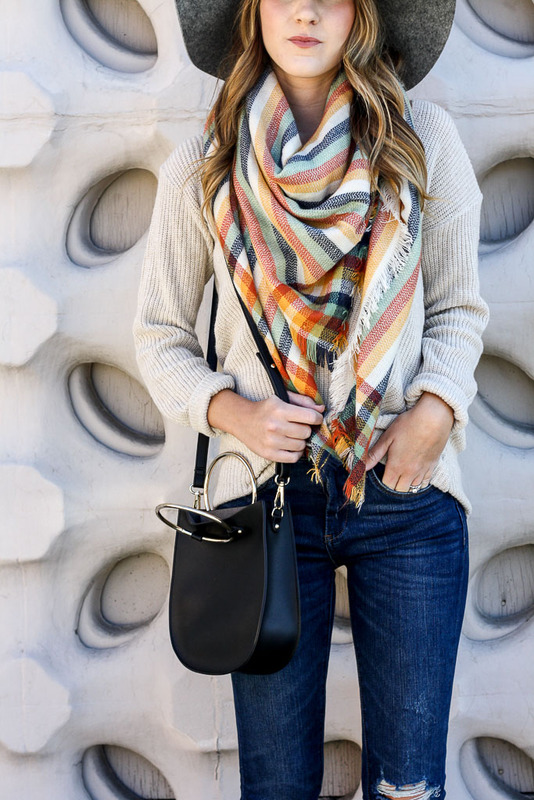 Check out a few more ways I’ve styled my favorite fall accessories here and here. This bell sleeve top is one of my newest favorites! It’s from one of my FAVORITE online boutiques, Nell + Rose! This summer, I styled a few of their tops (see the posts here and here). I fell in love with their easy to wear pieces that are trendy but easily mix and match with the rest of your wardrobe! This bell sleeve top might be one of the softest pieces ever! I love the color too…a perfect neutral shade that goes with EVERYTHING! I’ve already worn it to work tucked into a skirt, and on the weekend with my favorite distressed denim and booties. I just can’t get enough of these fun sleeves! Check out Nell + Rose for some unique pieces that you will be sure to love! There is nothing I love more than a good long sleeve tee in the fall and winter. As someone whose body temp runs cold, I find myself freezing from October to March. I live in layers, piling on all the scarves and cozy knits just to stay warm. My base layer is ALWAYS a long sleeve tee. From work to the weekends, I live in my long sleeves, so it’s important that I have a variety of cute and comfy options on hand! I am happy to report that I have found the ULTIMATE long sleeve tee at Nordstrom this year! In fact, I love it so much that I’ve already purchased it in 3 colors and plan on picking up a few more. One of the reasons I love shopping at Nordstrom is for their wide variety of items at varying price points! I am always sure to find things that I LOVE. There is a lot to love about this shirt…a rounded neckline, soft fabric and a longer length just to name a few! I love that the longer length allows me to wear it with leggings (bum coverage!) and the split hem adds a cute detail! I’ve also been tucking in the back and tying up the front to really mix it up! If I haven’t already sold you on this perfect long sleeve tee, the price should do it. This cutie is just $19!!!! For under $20, this basic is a total steal as I know I will get a ton of wear out of it! I thought I would show you 3 ways I have worn my 3 long sleeve tees! Look 1 is actually something I wore to work. I tucked my striped tee into the cutest corduroy skirt (under $50) and layered with a scarf (I also included tights for work!). I adore the stripes and plaid combo! For look 2, I paired my favorite base layer (jeans and a white tee…duh!) with the coziest cardigan. This is an easy outfit to recreate and could be worn to work by swapping the distressed denim for black pants or non-distressed skinny jeans. Look 3 might be my favorite. The longer length of this tee makes for the cutest layering piece. 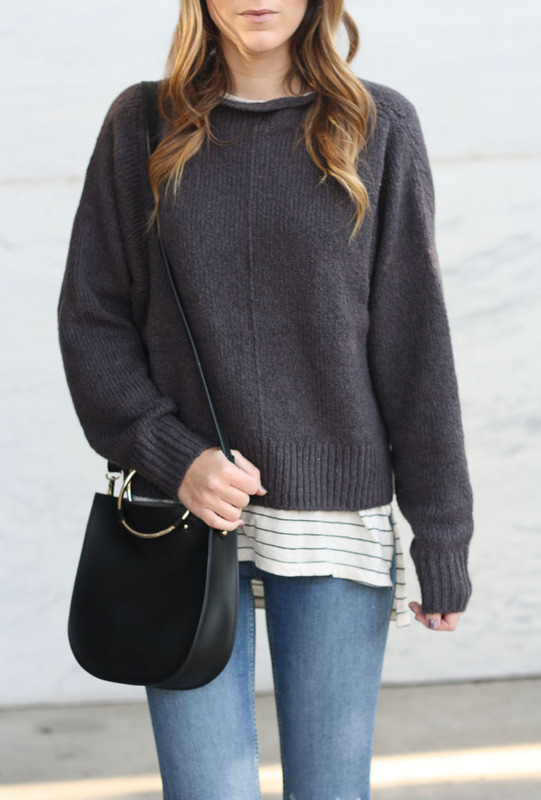 I love the pop of stripes peaking out from the sweater and it doesn’t hurt that it adds an extra layer of warmth! The temperatures have officially dropped and fall has arrived in full force. I’ve been wearing boots and sweaters to work and have STILL been cold throughout the day! It’s time to start layering up! 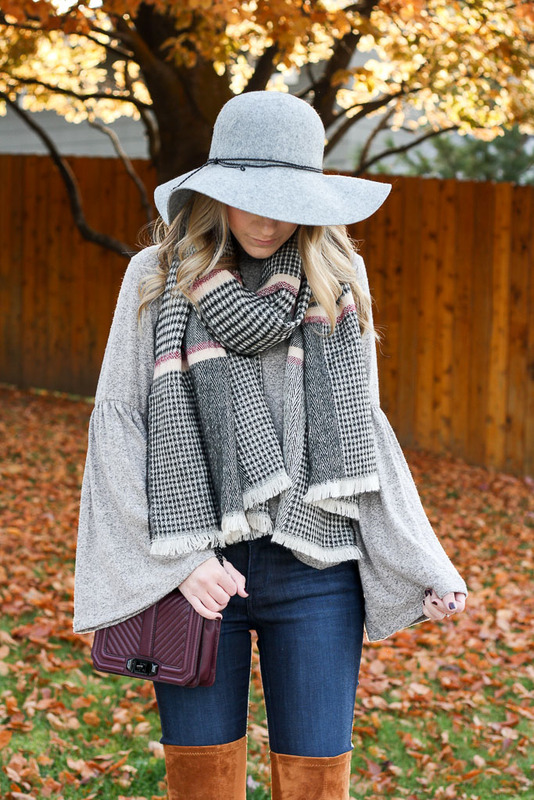 With the temperature change, I knew it was time for a wardrobe refresh for the new season and I picked up some fall essentials from Nordstrom that are perfect for layering! Cozy, neutral knits are must haves! I love finding pieces that are versatile and can easily take me from work to the weekend! The Nordstrom Trend section is ALWAYS the first place I check for their amazing prices and great selection. 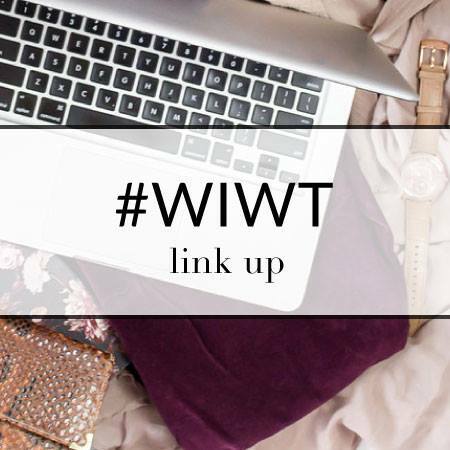 I love finding the seasons best trends and classic closet staples all in one place! have become some of my favorites. This neutral sweater is something I will be wearing a ton. It is under $50 and comes in 5 colors. It has a flattering v-neck and the longer length is perfect for wearing with leggings. These booties are under $100 and a total steal! They are so comfortable and I am loving the cognac color! 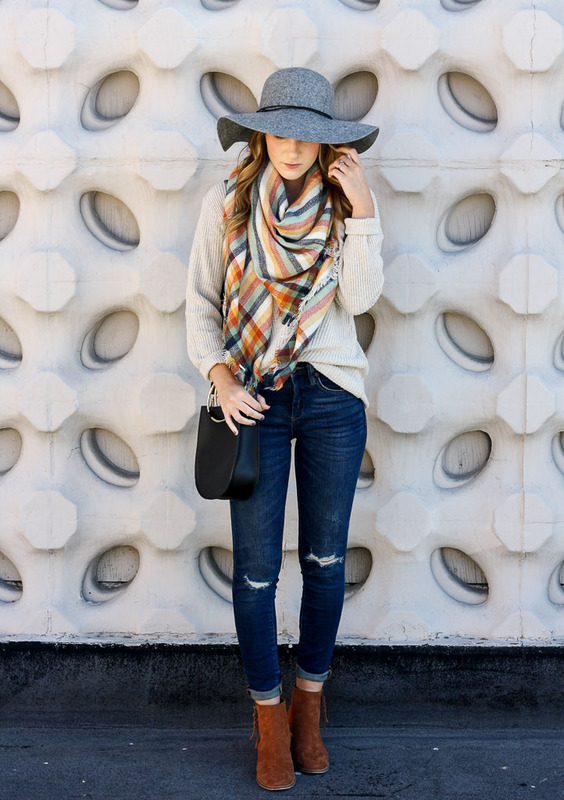 Some new fall accessories, like a cozy blanket scarf and wool floppy hat help to complete any fall outfit. 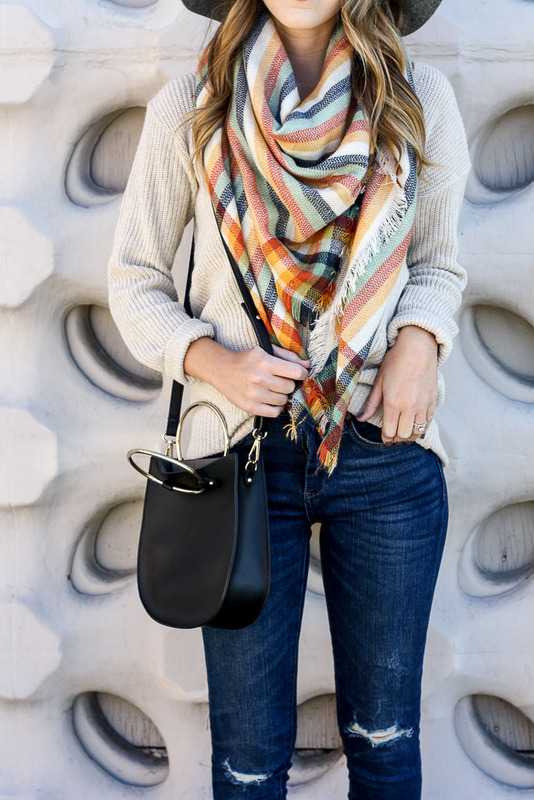 Adding a scarf to my outfit is one of my favorite ways to accessorize in the chillier months as it helps keep me warm all day! I don’t know about you, but I’ve been OBSESSED with bell sleeve tops lately! A great bell sleeve top can instantly add some fun to a pair of jeans or skirt. 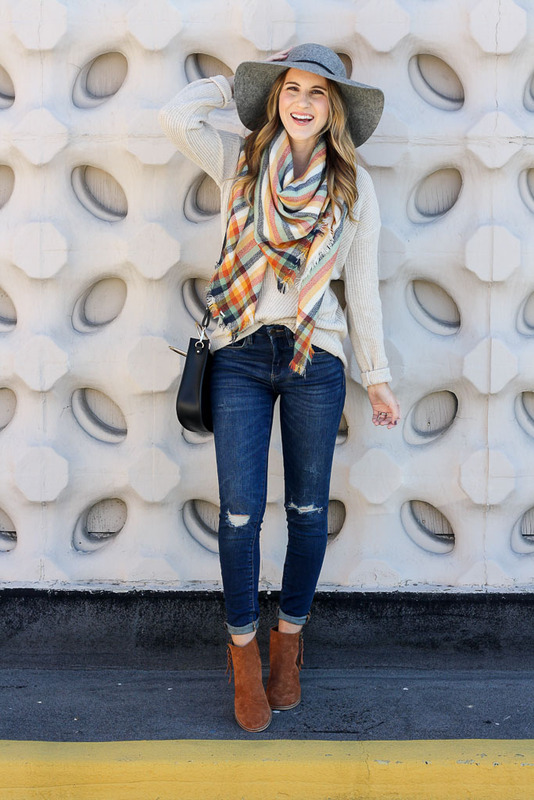 This is a perfect outfit for Thanksgiving festivities if you are looking for something a little dressier, or swap out the skirt for jeans for a more laid-back look! 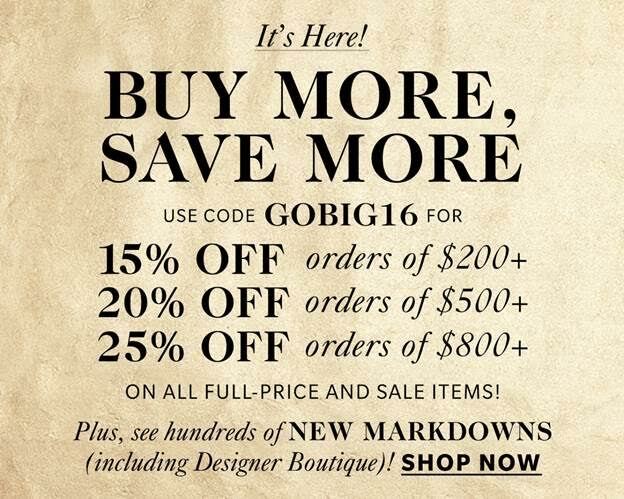 On to some more exciting news…one of my favorite sales of the year has officially arrived! Click the picture below to shop, but I will have a round up of some of my favorite goodies tomorrow!